This Strawberries and Cream Layer Cake combines three dessert favorites – moist vanilla cake, fluffy cream cheese frosting, and tart strawberries – into one mouthwateringly decadent dessert. Today my five-year-old looks up, as I’m in the kitchen and she’s in the playroom, and casually says, “Mama, I’m jammin’ the wifi.” (<— imagine this is said with the most country Southern accent you’ve ever heard). I’m not sure where my little aspiring hacker comes up with these things, but between her, her big brother, and her little sister, there’s literally never a dull moment. I love it. Speaking of jamming the wifi. 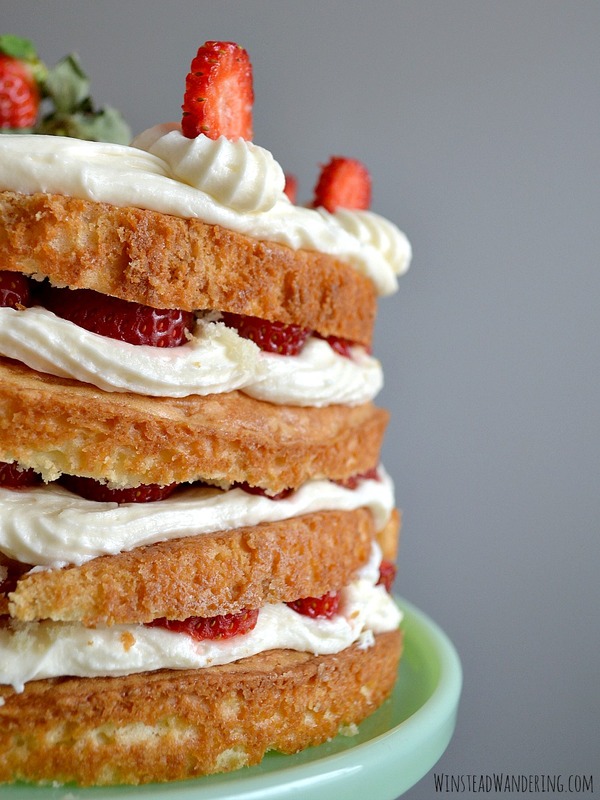 If there was a ever a cake that possessed the power to do just that, it’d be this Strawberries and Cream Layer Cake. This cake can jam wifi, slay dragons, settle feuds, and turn even the crappiest day good. It’s the cake equivalent of laughing baby videos. At first glance, it might seem like an ordinary cake. I use, as usual, a cake mix, but I add a bunch of stuff to fancy it up. 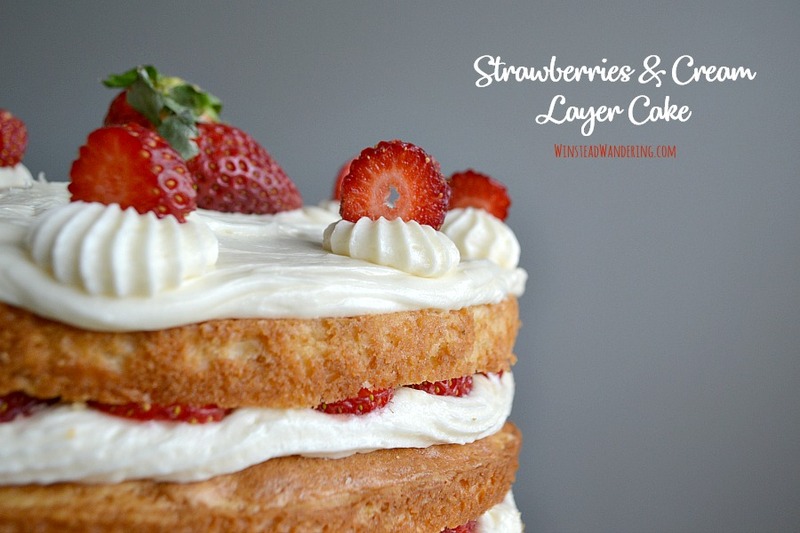 Sandwiched between each of the cake layers are gorgeous slices of fresh strawberries and a generous amount of homemade cream cheese frosting. The tender cake and the creamy frosting are uh-mazing on their own, but the addition of the tart berries rockets the whole thing into another stratosphere. Does that sound like hyperbole? Perhaps it is, but ask anyone who’s had a slice of Strawberries and Cream Layer Cake; they’ll vouch for me. Preheat oven to 350 degrees. In a large bowl, stir together the cake mix, flour, sugar, and salt. Add the sour cream, vegetable oil, milk, eggs, and vanilla extract. Whisk for two minutes, until few lumps remain. Divide batter evenly between two greased 8-inch cake pans. Bake for 25-30 minutes, or until a toothpick inserted in the middle comes out clean. Allow cakes to cool slightly in the pans before transferring to a cooling rack. Once cakes have cooled completely, use a bread knife or a piece of thread to cut them in half lengthwise, leaving four thinner layers. Next, prepare the frosting. In the bowl of a stand mixer, beat together butter and cream cheese for two minutes in medium speed, until light and fluffy. Mix in powdered sugar, one cup at a time, mixing to incorporate after each. Finally, add the vanilla and mix on medium for three minutes, until frosting is light in texture and in color. Slice the strawberries, reserving a few to garnish the top of the cake if desired. Cut the tip off the corner of a gallon zip-top bag (or use a piping bag), push the frosting tip through the hole, and fill the bag with frosting. Place three thin pieces of parchment paper in a triangle on your cake stand or plate. This is to protect the plate from crumbs; you’ll remove the paper after the cake is finished. Place the first layer of cake, cut side down, on the stand. Pipe the frosting in a solid layer over the top, and place strawberries in a single layer over that. Repeat with two more layers. Place the fourth layer of cake on top, cut side down, and pipe the frosting on top. Use an offset spatula to spread the frosting into an even layer, and then pipe stars around the edges. Garnish the top of the cake with strawberries in the middle and strawberry slices in each of the stars. Serve immediately, or store in the refrigerator for up to two days. Because the strawberries will bleed into the white frosting, it’s best to assemble the cake as close to serving time as possible. The key to this recipe is a moist cake; if your oven tends to bake hot, check the cakes earlier so as not to dry them out. You can spread the frosting on with a spatula instead of piping. Follow Winstead Wandering on Pinterest for plenty of mouthwatering food pins! 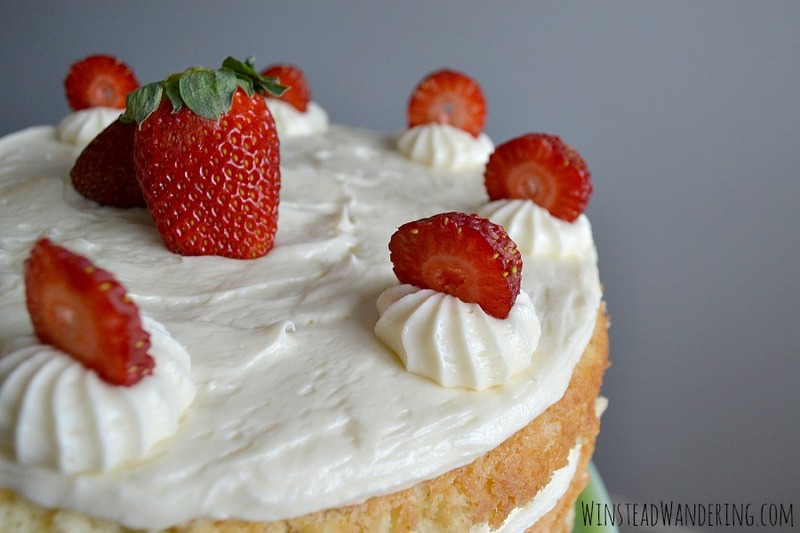 Pin this Strawberries and Cream Layer Cake recipe for later! This is gorgeous!! I love that you used cake mix. I think I actually have all of the ingredients to make this. I need to try this soon! Thanks, Cathleen! This cake definitely deserves a spot on your must-make list.